Winner of the 2016, A. Poulin, Jr. Poetry Prize; BOA Editions, 2017; 96 pp. Among poetry readers, there will be those who talk about what they themselves describe as their “love/hate” feelings for poetry. They’ll talk about it as one might of a history of mostly failed relationships: some promise of beauty followed by the awkwardness and difficulty of approach; in the end, the unassailability, rejection, and a falling short of the effort at meaningful connection. Such “bad experiences” lead to a general distrust of forms and lyric expression (Is it rhymey-rhymey? or I’m not really good at counting or patterns; or After everything I tried, I still don’t get it, etc. )—the notion that somehow it’s because poetry doesn’t use a currency allowing for the inclusion of ordinary life and language. with cardiac arrest. Birds would overthrow the cathedral towers. on his tragic uncle’s trampoline. We fell in love in midair. —my students held their hands over their hearts and basically (there really is no better word)—swooned. Then there was the time I came home from teaching one night in spring, when my in-laws happened to be visiting. I’d left my copy of When I Grow Up I Want to Be A List of Further Possibilities on the coffee table, and an hour or so later found my 83-year-old mother-in-law in the middle of it, reading with fascination. My mother-in-law might be the type of person who gamely plays Guitar Hero, or says that she likes Legos because she didn’t have those growing up. 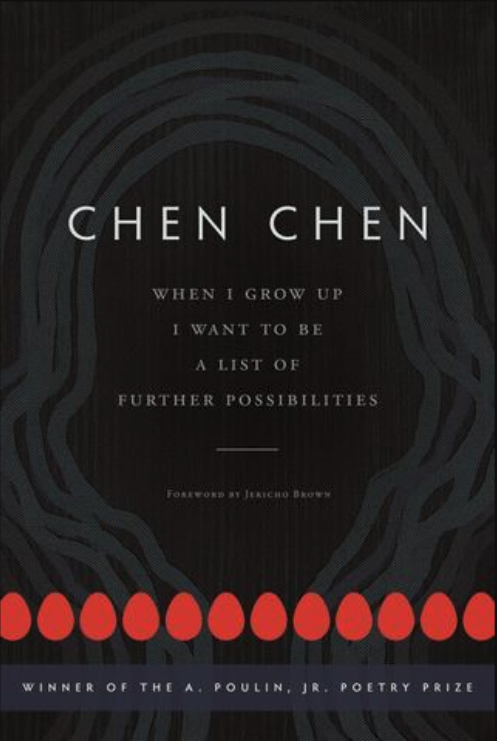 And it’s true that Chen’s poems are written in what 2016 A. Poulin, Jr. Prize judge Jericho Brown describes in the foreword as the “singular and sustained voice … of a speaker whose obsessive and curious nature is that of an adult who refuses to give up seeing through the eyes of an adolescent.” But I think what makes his work so infinitely appealing is its capacity to bring every kind of reader back to what poetry is supposed to be in the first place—a space of endless and transformative possibility, of buoyancy, of radical joy. says they took me to, & that I loved. In time, everything that happens to anyone can disappear or be taken for granted— just like the raised features of a once newly minted coin flattened almost to the point of indistinguishability after passing through so many hands. But Chen’s poems look at these moments again and throw them into surprising new pairings; it is then they surpass the condition of their banality. & he’d come out a better person, in beautiful shoes. American pond with its swans. She would. to replace the clock tick with tambourines. Like him, may we all be so fortunate.